In the first part of this series of articles (posted in mid March 2008) we examined the way in which of Newton’s laws of motion constrain the way in which we run. This section of the series will examine the ways in which we should orient our joints and contract our muscles to run efficiently and safely in accord with the constraints of Newtonian mechanics. It should be noted that the conclusions we draw should guide the way we judge running style objectively, such as when examining a video recording, or using specialized equipment such as a force plate or electromyography. These conclusions should not dictate the way in which we attempt to control our muscles consciously when running, because it is impossible to focus simultaneously on everything that matters, and furthermore, muscle actions that require precise timing are more effective when controlled automatically via habit than by imposition of conscious control. If we have not yet acquired the required habits, drills performed with a greater degree of conscious control might help establish the required automatic control. The issue of what perceptions we should attend to when actually running will be dealt with in a subsequent section on the psychodynamics of running. P1) On a level surface in the absence of wind resistance, no direct net propulsive force is required to keep the body moving at a constant velocity. However, energy is required to lift the body against gravity to compensate for free fall during airborne time, and also to accelerate each leg forwards in early swing phase so that it can overtake the torso and provide support at the next footfall. P2) When the leg is angled downwards and backwards in late stance, there is a forward-directed horizontal ground reaction force (GRF) that will propel the body forwards. In the absence of wind resistance on a level surface, this must be balanced by a backward directed horizontal GRF at some other part of the gait cycle. This will generally be provided by the braking effect in the first half of stance, provide the point of support in front of the body’s centre of gravity (COG) at that stage. Unless the foot lands in front of the COG there will be no compensation for the acceleration of he body in the late stance and hence , it will be impossible to remain in control at constant velocity. A face down crash will occur. P3) Any force that pulls the foot forwards towards the torso in early swing phase must be balanced by a compensating force that pulls the foot backwards towards the torso after the foot has passed beneath the torso. As a result, the foot will be travelling at the same speed relative to the torso (and therefore the same speed relative to the ground if torso moves at constant velocity) at foot-strike and was the case at lift-off. If velocity relative to the ground is zero at lift off, then velocity relative to the ground will be zero at foot fall. P4) Any external torque applied to the body at some point in the gait cycles (eg gravitation torque that arises when the COG is not aligned over the point of support) must be compensated for by an oppositely directed external torque applied at some other stage of the gait cycle. (In general, gravitational torque provides angular acceleration in a face forwards and down direction in late stance, and this must be compensated by a torque producing head back and downwards directed torque in early stance. P5) Mean vertical GRF during stance is equal to body weight x stride duration/time on stance. This equation must be satisfied to ensure that the average upwards force over the full gait cycle exactly matches body weight. These principles led us to the following conclusions about how we should run for optimum efficiency and safety (posted 22nd March, but repeated here for convenience). C4) The impulse require to lift the body against gravity must be provided by a downwards push of the leg against the ground. C6) Landing in front of the COG is inevitable to balance the effects of the forward directed hGRF acting in the second half of stance. C7) The majority of the impulse required to accelerate the legs forward past the torso and then decelerate them to provide support at foot fall, is best provided by internal muscle action that pulls the foot forward towards the torso in early swing and backwards towards the torso in late swing. These recommendations apply whatever running style we choose to adopt. The goal of the current article is to begin to address the question of how we should orient our joints and tension our muscles to achieve these recommendations. The connective tissues of the body (muscles, tendons, ligaments) are viscoelastic, which means that their stiffness depends on the rate at which force is applied. Therefore, it is virtually impossible to make accurate predictions about the exact consequences of any specific muscular action. The conclusions reached in this section are tentative and must be tested against experience. Furthermore it is likely that what works best for one individual in one circumstance might not be best for other individuals, or indeed even for the same individual under different circumstance. A1) Musculo-skeletal tissues are more likely to be damaged by forces that are applied abruptly. For example, Simpson and colleagues in their chapter in Exercise and Sport Science (edited by WE Garrett & DT Kirkendall) provide references to several studies that indicate that the rate of impulsive loading might determine the risk of degenerative changes to cartilage. A2) Tissue rupture can occur after many repeated applications of a relatively small force which is below the threshold required to cause tissue rupture on a single application. This is why repetitive strain injuries arise in tendons after thousands of repetitions of the same small impact such as is generated when playing a piano, and why metal fatigue caused ships in World War 2 Atlantic convoys suddenly broke up and sank in mid-ocean after many repeated relatively minor impacts with ocean waves. A3) Muscles develop greater force when a concentric contraction (in which the muscle shortens as it exerts force) follows an eccentric contraction (in which the muscle is stretched by an external force while the contractile process within the muscle exerts an opposing force. This is known as the stretch shortening cycle (SSC). The effectiveness of the SSC depends on the period of time between eccentric contraction and the subsequent concentric contraction (known as the amortisation time). This probably depends on circumstance such as the size of the muscle and the stiffness of the muscle during the eccentric contraction, which in turn depends on the rate at which the external force builds up, because muscle and tendon is viscoelastic. A typical manoeuvre that illustrates the SSC is the drop jump in which the body drops from a height (typically 50-100cm) and then rebounds into the air. On initial impact, some of the energy of impact is stored as elastic energy and then recovered as the muscle recoils. 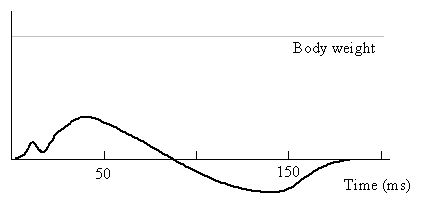 As the height of the drop increases, the height of rebound increases up to a certain optimum value and then decreases. At the optimum, the maximum amount of elastic energy is recovered in the recoil. Data collected by Ishikawa and colleagues demonstrates that the duration of the eccentric contraction of the quadriceps is around 100 milliseconds when the maximum rebound is achieved. If the leg were stiffer at impact, the optimum would be achieved at a shorter time. If it were less stiff, the optimum would be achieved at longer time. Thus, we will assume that the optimum amortisation time for human leg muscles when running is in the range 50-150 milliseconds; shorter values will apply when the leg is stiffer on impact. In general a stiff spring stores elastic energy more efficiently and delivers it for re-use more rapidly than a soft spring. The connective tissues of the legs are viscoelastic which means that stiffness will be greater when the tissue is subjected to a rapidly rising force. Therefore, for maximum mechanical efficiency of elastic recoil, the joints and muscles should be deployed so that impact forces are absorbed rapidly, and the time on stance should be should be correspondingly short to allow efficient recovery of the elastic energy. However risk of tissue damage, both short and long term, is likely to be greater if vGRF rises rapidly (assumption A1 above). Impact will stretch the quadriceps and calf muscles. This stretching is likely to cause microscopic tearing of muscle fibres, which is the most likely explanation for delayed onset muscle soreness (DOMS) experienced the day after heavy exercise. Furthermore, immediately after substantial use muscles suffers a loss of power that lasts for one or two days, consistent with the possibility that microscopic tearing has weakened the muscle. In long events, such as a marathon or ultra-marathon, in which the legs will be subjected to thousands of repeated impacts, it is especially important to minimise microscopic tearing. Furthermore, in the case of runners who have recently adjusted their running style or are currently unfit, the risk of microscopic tearing is likely to be increased because the adjustment of muscle tension and joint position is likely to be less finely tuned. Thus there are a variety of circumstances in which minimization of risk of tissue damage might take precedence over achievement of maximal mechanical efficiency. Under such circumstances landing might be softened so as to avoid abrupt rise in vGRF. Fortunately, under such circumstances the time optimum time scale for recovery of elastic energy will be increased, so provided time on stance is adjusted appropriately, it is nonetheless possible to retain at least a moderate level of mechanical efficiency. Thus, one consequence of the viscoelastic nature of human connective tissue is the possibility of adjusting rate of rise of GRF so as to reduce risk of tissue damage without serious loss of efficiency. The third goal to be achieved at foot fall is avoidance of over-striding. Although many experts since (and perhaps even before) Gordon Pirie have emphasized the importance of avoiding over-striding, it is not easy to define what is meant by over-striding. For the purpose of this discussion, we will define over-striding as landing further forward than is necessary to counteract the inevitable forward directed GRF that arises from the backwards angling of the leg during the second half of stance when duration on stance is optimal for the circumstances. One consequence of the forgoing considerations is that the optimum foot fall depends on circumstances. There is no single universally applicable description of how the joints and muscles should be deployed. While this flexibility allows for adjustment according to priorities, it might seem daunting that there are many possibilities. Fortunately, as we will see in the finals section of this series of articles, most of the required adjustments are automatic provided we focus on a few essential features. The foot human is exquisitely designed for the absorption and distribution of elastic energy to structures such as the medial longitudinal arch, and it seems sensible that when running the foot should be allowed to fall in a manner that utilizes this design, except under circumstances such a sprinting, where a high degree of stiffness of the leg is required to ensure very rapid return of the stored elastic energy. Because our main concern in this article is with middle and long distance running we will focus on the mechanism for transferring the load to the medial arch. As the foot falls the leg must be angled towards the mid-line of the body to ensure that COG advances in a straight line. Hence the foot strikes on the lateral side. The ankle should be very slightly plantar flexed and the initial point of support a little forward of mid-foot. The foot rolls inwards (pronation) so that the load is transferred towards the medial side, and the plantar flexion of the ankle is relaxed so that the heel touches the ground, to minimise the stress on the Achilles tendon. Otherwise, the Achilles tendon would be required to support a downwards force typical several time body weight via a cantilever. There is debate about the degree to which force should be transmitted to the ground via the heel. In the manual for the Pose Method, Dr Romanov states that the heel should only lightly brush the ground. My own belief is that under circumstances where avoidance of damage to tendons and muscles is a priority (eg during a marathon or ultra-marathon) it is best to allow the heel to bear appreciable weight. As the COG passes forward of the point of support, the ankle should remain approximately neutral but because the leg is now angled backwards, the point of support moves forward in the under surface of the foot and the foot should roll outwards slightly (supination) as recoil occurs. The process of pronation followed by supination transfers weight to the medial arch and then allows recoil that employs the stored elastic energy to provide an upwards impulse. The degree of pronation should be modest to ensure that the elastic energy is not dissipated prior to recoil. The knee should be at least slightly flexed at footfall to ensure that the quadriceps absorbs much of the energy of he impact. If the quadriceps is quite highly tensioned prior to impact, the energy of will be absorbed rapidly. This is appropriate when sprinting but for middle and long distance runners, there should be less tension in the quadriceps allowing a somewhat greater knee flexion and more gradual absorption of elastic energy. Where should the foot fall? Unless wind resistance is sufficient to counteract the forward directed GRF generated in the second half of stance, the point of support at foot fall must be in front of the COG in order provide adequate braking to prevent uncontrolled acceleration. As implied in the definition of over-striding given above, the point of support at foot fall should be the minimum distance necessary to compensate for that part of the forward GRF that is not counteracted by wind resistance. The longer the duration of stance the greater the horizontal GRF and the hence the further forward the point of support should be a footfall. Thus, time on stance determines where the foot should fall. What is the optimal time on stance? It can be shown that the energy consumed in generating the forces that elicit the horizontal ground reaction forces is proportional to velocity squared multiplied by time on stance (see calculations page – to be presented early April). At moderate and high speeds the energy cost of generating these horizontal forces become appreciable compared with the energy costs of compensating for free fall when airborne, so it is desirable to keep time on stance as short as possible. However if time on stance is too small vertical GRF becomes damagingly high and furthermore there is a risk that stored elastic energy will not be recovered efficiently. Thus, the optimum time on stance will depend on the relative priority of speed versus minimization of damage to tissue. As discussed above in the section on assumptions, the available evidence suggests that elastic energy can be recovered with times on stance ranging from around 50 to 150 milliseconds, depending on how rapidly GRF rises. When speed is the priority, the knee should be held fairly stiffly at foot fall leading to rapid rise in GRF and rapid accumulation and then release of elastic energy. Time on stance will be as short as 50-60 milliseconds. This time on stance will generate vGRF that is 4-5 times body weight at cadence 180 /min. As approximately half of the time on stance is spent with the point of support in front of the COG, footfall should occur approximately 25 -30 milliseconds before COG passes over the point of support. This footfall should be about 10 cm in front of the COG at a speed of 4.1 m/sec (equivalent to 4 min per Km). When minimization of tissue damage is the priority, (eg in a marathon or ultra-marathon or for a runner with less skill in controlling a rapid rise in vGRF) it would probably be prudent to land with foot fall up to 50-60 milliseconds before the COG passes over support. Provided the knee is allowed to flex somewhat more to give a relatively soft landing, the rate of uptake of elastic energy and its subsequent recovery can be slowed sufficiently to match the time on stance. Mean vGRF will only be about twice body weight. To minimize shearing forces in the foot, horizontal speed of the foot relative to the ground at foot fall should be near to zero. In fact provided the forwards impulse delivered while the leg was angled backwards in the latter part of the previous stance was exactly matched by the braking impulse in the first part of that stance (plus wind resistance), and also providing the accelerating impulse during early swing was matched by a braking impulse during later swing, the speed of the foot will automatically be adjusted to zero at footfall. Note that swing phase and stance phases impulses must be balanced separately, since only the stance phase horizontal forces exert a net effect on the body as a whole, and these must therefore be balanced (after allowing for wind resistance) to achieve a constant forward motion of the body. At foot fall, the ankle should be slightly plantar flexed, and after initial impact on the lateral side of the foot a little in front of mid-foot, the load should be transferred to the medial arch by a small degree of pronation. The location of point of support on the sole of the foot should move slightly backwards and the heel should touch the ground before the point of support moves forward again after the COG passes over it. Finally mild supination promotes recoil releasing the stored elastic energy. The degree of stiffness of the knee joint should be adjusted according to the relative priority of speed versus protection against tissue damage. At foot fall the point of support should be in front of the COG by the minimum amount needed to provide braking to compensate for the forwards impulse delivered when the leg is angled down and backwards in late stance. This amount will depend on duration of stance, but typically the time from footfall to when the COG passes over the point of support should be in the range 25-50 milliseconds, with the shorter durations being appropriate when speed in the priority and longer duration appropriate when minimizing risk of tissue damage is the priority. At foot fall, the horizontal speed of the foot relative to the ground should be zero. This will be achieved automatically if the pairs of horizontal forces acting during the various phases of the gait cycle are well matched. The muscle actions required in late stance and during swing phase will be discussed in future blogs. This posting is a continuation of the article examining the constraints that the laws of Newtonian physics place on how we run. In the introduction to this series of articles, posted on 18th March 2008, it was pointed out that being airborne for part of each stride is the defining feature of running. A posting on 21st March examined the nature of the forces acting on the body of a runner, and in particular, addressed the question of what is required to maintain forwards momentum. This posting addresses the implications of Newtonian physics for how a runner gets airborne. The full series of postings is assembled in order of posting in the page ‘Running: a dance with the devil’ accessible via the side bar of this blog. While forward momentum can be maintained fairly easily provided the braking forces in the first half of stance are kept within reasonable limits, getting airborne is both consumptive of energy and risky. To elicit such a vGRF, a powerful downwards push by the leg on the ground is required. At least some of this downward push can be supplied by elastic recoil of tissues that were stretched at impact. However, it is likely that capture of the energy of impact and its subsequent recovery can only be performed efficiently if time on stance is quite short . The improvement in efficiency with decreased time on stance (at all except very slow speeds) presents us with the central challenge of the dance with the devil. When time on stance is short, vGRF is high. Exerting a push that is several times body weight is likely to demand strong muscles and is very consumptive of energy unless a substantial proportion of the energy released by the impact at foot fall can be stored as elastic potential and recovered in late stance to hep generate the vGRF required to propel the body upwards. However, efficient capture of the impact energy and its subsequent recovery is likely to place substantial stress on muscles, tendons and ligaments, unless it is done very skilfully. As discussed in the previous section, a short time in stance is preferable with a view to efficient capture of the energy of impact as elastic energy and the subsequent re-use of that energy to help propel the body upwards for the next airborne phase. When time on stance is short compared to airborne time, the amount of acceleration of the foot and leg necessary to allow the foot to overtake the torso in mid-swing is lower than when time on stance is a large part of total stride duration, For example, if time on stance is half of stride duration the average velocity of the foot must be twice that of the torso during the time from lift off to mid-swing when the swinging foot passes under the COG, whereas if the time on stance is one fifth of total stride duration, the average velocity of the swinging foot during the first part of swing need only be about 20% greater than the velocity of the torso. These consideration demonstrate that despite the fact that some of the acceleration and deceleration of the foot and leg must be done by hGRF (which is a reaction to the horizontal component of push upon the ground during stance) it is preferable that the majority of the acceleration and deceleration should be done by contraction of muscles so as to pull the foot towards the torso. In the first half of swing, such a pull will accelerate the foot and leg; in the second half of swing, such a pull will decelerate the leg. It is also important to note that just as the magnitude of the forward impulse by external forces (hfGRF) must be equal to the backward directed impulse by external forces (nbGRF), similarly , the acceleration due to pull in the first half of swing must be matched by an equal deceleration by pull of the foot back towards the torso in the second half of swing. 2) Time on stance should be small compared with airborne time (though at very slow speeds total energy cost actually increases as time on stance decreases while high cadence is maintained). 7) The majority of the impulse required to accelerate the legs forward past the torso and then decelerate them to provide support at foot fall, is best provided by internal muscle action that pulls the foot forward towards the torso in early swing and backwards towards the torso in late swing. As discussed in the introduction to this series (posted on 18th March 2008) the essence of running is locomotion in which the length of stride is increased by becoming airborne for a part of each stride. In this article e will consider the constraints that the laws of Newtonian mechanics place on how we run. These laws apply whatever running style we adopt. The laws do not tell us which muscles we should use to achieve our goal, but they do provide guidance to help answer questions about optimum cadence and stride length and the relative proportion of each stride that should be spent airborne for optimum efficiency and safety. Before starting, we should define a few of the terms we will use. The full gait cycle covers the period from the time at which one foot contacts the ground (foot-fall) to the next time point at which that same foot contacts the ground. For ease of description, we will assume that this foot is the right foot. During the cycle, there are several phases. At first, the right foot remains stationary on stance while the torso passes forwards over it. Once the torso has passed over the point of support (usually located under the forefoot), the hip extends backwards until the point of lift-off is reached, initiating the swing phase for the right leg. The first airborne phase continues until foot fall of the left leg. While the left leg is on stance, the right leg continues to swing forwards. Shortly after the left leg lifts from the ground, the right leg reaches it forward most point of travel relative to the torso and then drops to the ground. At footfall of the right foot, the full cycle is completed. It contains one period of stance for each foot and two airborne phases. Note that the swing phase for one leg includes two airborne phases and also the period while the other leg is on stance. Stride length is the distance on the ground from where the right foot contacts the ground to the point where the left foot contacts the ground. Cadence is the number of strides per minute. (Note that some people define cadence as number of gait cycles per minute, giving numerical values half as large as the values we will quote.) Speed is obtained by multiplying stride length by cadence. For most runners, cadence is approximately constant through the much of their range of speeds, and is typically 180 strides per minute. At this cadence, a stride length of 1 metre corresponds to a speed of 180 metres per minute (which is a little slower than 1Km in 5 minutes or 1 mile in 8 minutes.) Speed can be increased at constant cadence by increasing stride length. At a cadence180, a stride length of 2.2 metres corresponds to 4 minute mile pace is . Although gravity acts on each part of the body, for the purpose of estimating the overall effect of gravity on the body, the force of gravity can be treated as acting through the general centre of mass (gcm) of the body, which is also called the centre of Gravity (COG). Although the anatomical location of the cgm moves slightly within the body as the legs move relative to the torso, the COG is always in the vicinity of the midpoint of the line that joins the iliac crests (the prominent curved bony ridge above the hip and just below the waist level on each side of the body); it is the top edge of the side of the pelvis.) Because gravity act downwards, it cannot directly produce acceleration or deceleration of the body in a forwards or backwards direction. Thus, gravity does not directly produce any change in forward momentum. If a force F acts for a time t, then it can readily be shown from Newtons second law of motion (F=ma) that the force produces a change in momentum given by Ft. This product of force and time is known as the impulse delivered by the force. a) In the absence of wind resistance, the impulse due to backwards directed GRF must equal that due to forwards directed GRF. The period that the foot is on the ground before GOG passes over the point of support must be approximately equal to the period after the COG passes over the point of support. If one lands with point of support directly under the COG, impulse due to hfGRF will not be balanced by a braking impulse , and the body will accelerate out of control. Thus, except in the presence of a substantial head wind, the advice to aim to land under the COG, commonly given by advocates of efficient running, is misleading. In fact, video recording of runners demonstrate that the foot does land in front of the COG even in individuals who aim to land under the COG. When the long axis of the body is leaning forwards (i.e. when the COG is in front of the point of support) gravity acts obliquely relative to the axis of the body. Therefore, there is a component of gravity at right angle to the body that can be considered to be acting at the site of the COG. If the body is on stance the foot is fixed, the component of gravity at right angles to the body is will exert a torque that tends to cause the body to rotate in a face forwards and downwards direction. This situation exists during the latter half of the stance phase. If a face-down crash is to be avoided, this rotation must be reversed at some other point in the gait cycle. Torque can only be applied by an external force acting on the body. The only tow such forces that might reverse the rotation are wind resistance and the oppositely directed gravitational torque that will be generated when the COG is behind the point of support. We have already seen that in order to avoid uncontrolled acceleration in the absence of a strong head wind, it is essential to land in front of the COG. The need to cancel rotation provides an additional reason why we must land in front of the COG. Horizontal ground reaction force is due to friction which arises in reaction to the horizontal component of forces acting obliquely down the leg . Friction is minimal on ice. Therefore, in order to run on ice, it is essential to spend a very short time on stance, so that the long axis of the body never becomes more than very slightly oblique while on stance. This demands a very short time on stance. As well shall see in the next section, very short time on stance is associated with large vertical ground reaction forces. Nonetheless, running on ice is possible, though it is a stringent test of the ability to lift the foot from stance quickly. This article will be continued in a subsequent post. The essence of running is becoming airborne. When a human wants to increase speed while walking, he or she can increase stride rate or stride length. Beyond a certain stride rate, muscle contraction becomes inefficient because force is generated by a ratchet-like interaction between actin and myosin molecules within the muscle fibre, and the speed of this ratchet action is limited by the time it takes to make and break chemical bonds. Beyond a certain stride length, efficiency falls due to poor leverage of muscles on awkwardly angled legs. So the only practical option for further increase in speed is to increase stride length by becoming airborne for part of each stride. Thus we make the transition from walking to running. One of the most dramatic moments of the recent Pose Clinic in Loughborough occurred when Dr Romanov selected a volunteer from among the group of Pose novices for a special experience. The novice was instructed to close his eyes and run, Pose style, while Dr Romanov guided him by holding his wrist. At the time we were gathered on the edge of a grass playing field at the base of a steep grassy slope, perhaps inclined at 1 in 5. Dr Romanov set-off leading the novice along the edge of the field and then turned up the slope. At the top, they turned and ran down again, finally turning back along the edge of the playing field to where we were assembled. The novice was allowed to open his eyes and asked where he had run. He indicated a level course along the field. He was incredulous when informed that he had been to the top of the hill. Then we all had an opportunity for a similar experience. My guide wove a sinuous path to throw me off the scent. I concentrated on pulling my foot from stance as rapidly as possible on each stride, and avoided focus on foot-fall, as we had been instructed the previous day. At times I had the sense that we were traversing across a slope because I perceived that one foot was landing lower than the other, and occasionally I was aware that we were going downhill because I received a slight jolt at foot-fall. When I finally opened my eyes, I was just as amazed as the first novice had been to discover just how much hill climbing I had done without perceiving any extra effort. So what was there to learn from this amazing experience? The first lesson is that perception can be quite different from reality. The second lesson was that removing preconceptions can make things easier. Perhaps much of the effort we perceive when running up hill comes from our preconception that running up hill is effortful. The third implied lesson is that Pose method makes running up hill easy. Chapter 32 of the ‘Pose Method of Running’ deals with running up and down hills. When describing uphill running on page 210, the authors, Dr Romanov and John Robson, state: ‘The momentum of your running plus the forward lean allows gravity to continue to work for you – you literally free fall uphill.’ To the amazed novice experiencing the blind-fold hill running session, the conclusion seemed inescapable. Pose made hill running easy. I believe that at least two of these three conclusions are true, so it is worth stepping back and looking a little more closely at each. With regard to the first conclusion that perception can be quite different from reality, Dr Romanov had pointed our several times during the weekend that we can only be conscious of one thing at a time. (This of course is the source of a magician’s magic). We had been instructed that when running Pose style we should focus solely on a rapid pull of the foot from stance. This is almost certainly excellent advice because it minimises the waste of energy and increased risk of injury associated with actively pushing downwards at footfall. Not surprisingly, we failed to perceive the premature footfall and shorter stride when running up-hill, and similarly failed to perceive the slightly delayed footfall when running downhill. So the practical conclusion is that when running we need to identify what we should choose from among the possible things we could focus on, to achieve our goal. Focus on the pull from stance appears to be a good choice. Most people find running up hill effortful even when they decrease their speed. Dr Romanov emphasises that when running up hill the stride should be shortened so that perceived effort remains constant. That is what he did when leading the novice up the hill. When deprived of an unhelpful preconception, running uphill with an appropriately reduced stride-length requires no additional effort. The third implied conclusion that Pose method makes uphill running easier because ‘the momentum of your running plus the forward lean allows gravity to continue to work for you – you literally free fall uphill’ requires closer inspection. Once you are moving at constant velocity, the main influence that keeps you going when on a flat surface is indeed momentum. As discussed several times on my blog, most recently in yesterday’s post, I believe that gravitational torque cannot provide propulsion, either on the flat or up hill, simply because any torque applied at some point in the gait cycle must be cancelled by an opposite torque at some other point in the cycle, if we are to avoid a face-down crash. When running up-hill work must be done against gravity. There is no plausible source other than muscular effort. If the guide sets the pace such that perceived effort is constant due to deceased stride length, less muscular work is required per stride to accelerate the leg from stance to overtake the advancing torso. The energy saving (per stride) provides the energy necessary to raise the centre of mass up the hill. Unfortunately we require more strides to cover the same distance compared with running on the flat. The rate of energy expenditure in not increased but the duration is. I have just returned from a very enjoyable and informative weekend Pose Running Clinic led by Dr Romanov. I learned a lot of useful and thought provoking things about efficient running during the weekend, and will post my thoughts on some of these topics over the next few weeks. Meanwhile, in this posting I will summarize some of my main impressions. It was a delight to meet Dr Romanov. The meeting confirmed that he is a charismatic person with many very valuable insights in to running. Previously in this blog I have expressed doubts about some of the biomechanical principles underlying Pose, and indeed I continue to have these misgivings. However, these misgiving need to be interpreted in light of the distinction which Dr Romanov himself makes between the psychological reality and biomechanical principles of efficient running. Psychological reality refers to the state of mind that facilitates the performance of efficient running. The biomechanical principles are the principles of Newtonian mechanics that govern the way in which we run. On this weekend clinic, the main focus was on the psychological reality. In general, focusing the mind on biomechanical principles when running is unhelpful because conscious attempts to manage all aspects of running style while running interfere with the automatic mechanisms by which our body reacts to the forces acting on it. Indeed our perceptions of what we are doing can in some circumstances by quite different from the biomechanical events. Two illustrations of this are provided by the Pose concept that gravity is a source of free energy, and the concept of gravitational torque. In Dr Romanov’s book ‘The Pose Method of Running’ (2002 edition), chapter 12 is entitled ‘ The Free Falling Concept’. In that chapter, on page 62, he states ‘The great runner is not impervious to gravity; instead he taps into it as a readily available source of free energy. In the same way that the tremendous force of gravity inevitably draws a free falling sky-diver towards Earth, we can appropriate the force of gravity to run further, faster and with less effort.’ From the biomechanical point of view, this statement is at best misleading, and at worst simply wrong. When running on a level surface, the gravitational potential energy at the end of each gait cycle is the same as at the beginning of that cycle. Gravitational potential energy is proportional to height about the Earths surface. Therefore, gravity cannot be a source of free energy for a runner on a level surface. However, the important psychological issue is that a belief that we need to push off from strongly from the ground at the end of the stance phase in each gait cycle in order to run fast is very likely to lead to serious inefficiency and risk of injury by promoting over-striding. My weekend at the Pose Clinic has helped me refine my ideas about the best way to define ‘over-striding’, but that will have to wait for a later posting. The crucial point for the present discussion is that focus on correct biomechanical principles can lead to an unhelpful psychological approach. In contrast, the belief that gravity is a free source of energy might promote a less forceful push-off, thereby minimising the risk of over-striding. Dr Romanov emphasises strongly that when the long axis of the body is leaning forwards, the force of gravity generates a torque that provides forward propulsion. One of my calculations presented in the side bar of this page suggests that the amount of angular momentum generated by gravitational torque is probably small compared with the angular momentum that arises from the fact that a body moving horizontally forwards will inevitably begin to rotate in a ‘head forwards and down’ direction around the point of support when the foot is held stationary on the ground. My calculation was based on model that is only valid for a rigid body that does not extend at the hips. In fact, appreciable extension at the hip is inevitable in the latter part of stance. At some point in the future I will present a more precise calculation taking account the effect of hip extension. However, I do not believe the more accurate calculation will lead to a substantially different conclusion, but in any case, the magnitude of the increase in angular momentum due to gravitational torque is not the most important issue. If we are to avoid an ever-increasing rotation in a face forwards and downwards direction, the effect of gravitational torque must be reversed by some equal and opposite torque at some point in the gait cycle. Hence, gravitational torque cannot provide forwards propulsion. This is the biomechanical reality. However, the psychological reality is that forward lean leads to increased speed. In fact this is most apparent when a sprinter accelerates from the starting blocks. The biomechanical fact is that it is not gravitational torque that provides the propulsion; it is the muscular actions that moves the legs forwards rapidly enough to avoid a face-down crash. However, focus on forward driving action of leg muscles is generally counterproductive, so the concept that gravitational torque provides propulsion might be a useful psychological reality. The Pose Method places a very helpful emphasis on the role of body perception in efficient running. Dr Romanov emphasises that the proprioceptive sensations from the muscle and joints are crucial for accurate timing and direction of the muscle actions during running; especially for the action of pulling the foot from the ground at the end of stance. However, even here there can be a disparity between subjective experience and objective reality. At the Pose Clinic, it was stated that one should aim for the sensation that the foot lands beneath or even behind the body’s centre of gravity (COG). This statement is reinforced by the statement on page 311 of ‘The Post Method of Running’, that landing ahead of the body is a common error. However, the biomechanical realty that a torque imparted at some time during the gait cycle must be reversed at some other point in the gait cycle makes it almost mandatory that the point of support at foot-fall must be in front of the COG. When support is in front of the COG, the gravitational torque acts that tends to pull the body backwards and down, thereby compensating for the ‘face forward and downwards’ torque applied when the support is behind the COG. Though it seems a shame to be obliged to suffer this braking effect, it is imperative to avoid a face down crash. Rather enigmatically, this is implicitly accepted in the Pose Method criterion that the period on stance should consist of one video frame (33 milliseconds) from footfall to mid-stance (the Pose position when the point of support, COG and shoulder are aligned in an almost vertical orientation) and one video frame with between mid-stance and lift-off from stance. So there is a discrepancy between the recommended subjective perception and one of the observable criteria for good Pose Method running. For me the most thought provoking issue raised at the Clinic was the recommended duration on stance. I have previously suggested, on the basis of my own experience, that unless a runner is quite fit, he/she should be cautious about having period on stance of less than 120 milliseconds. My own experience has been that for runs of 15K or longer, if I spend less than 120 milliseconds on stance, I experience some pain over the metatarsal heads the following morning. However, using the technique recommended at the Pose Clinic I found that I was able to reduce my time on stance to 80 milliseconds while feeling that my footfall was fairly light. On the first day of the clinic I spent 20 minutes or less running with time on stance around 80 milliseconds, and the next morning I was aware of mild pain under my metatarsal head. However, on discussing this problem with Pose Coach, Mark Hainsworth, and also with Dr Romanov himself, I came to appreciate that it is likely that I can avoid this metatarsal pain if I allow my heel to rest lightly on the ground during stance. Contrary to the impression created by all of the diagrams in ‘The Pose Method of Running’, Dr Romanov does actually recommend lowering the heels to the ground. I have not yet had the opportunity to combine the technique I learned at the Clinic with lowering the heels to the ground, but once I have had the opportunity to test this, I will review my previous blog posting and perhaps revise my conclusions regarding time on stance. You are currently browsing the Canute's Efficient Running Site blog archives for March, 2008.